An incredible collection of local artists (including a few of our student participants!) are lending their talents to this April 12th benefit for the Abundant Life Fellows! 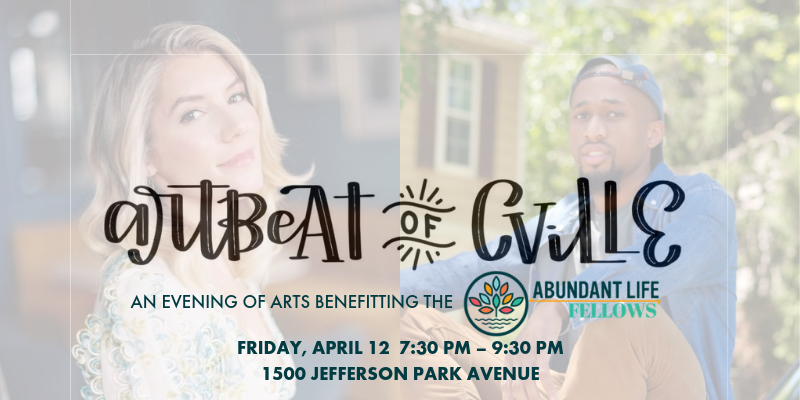 ArtBeat of Cville will feature singer-songwriter Lora Kelley, hip hop artist Nate Emmanuel, singer Dominique DeBose, singer-songwriters Micah Iverson and Aaron McGinnis, poet James Cole, and student performers Elana West-Smith and Cardale Emmery. Dessert will be served and childcare will be provided for children 11 and under (Please message us on the Facebook event page to let us know you’re bringing children). Parking: 15-20 spots in the Eunoia building lot (off Brandon Avenue). Overflow parking is available at the Nursing School garage under McLeod Hall.